Finally Apple has released its most advanced and most feature packed version of iPhone till yet called "iPhone 5" (the sixth-generation of iPhone of its kind after iPhone 4 and iPhone 4S) on its main event held in San Francisco, USA at the Yerba Buena Center for Arts with the accompanying caption "It’s Almost Here" on 12th September, 2012. According to the tech analyst iPhone 5 is the biggest redesign of the Apple's product since Steve Jobs revealed the first iPhone model way back in January 2007. Apple not only announced and revealed its next generation of iPhone 5 but also made announcement of next generation of its other products including new Apple iPod Nano 7th Gen, Apple iPod Touch 5th Gen, Apple EarPods (Audio Device), Apple iTunes 11 and Apple iOS 6 Final build. The new iPhone 5 have got some useful hardware and software upgrades as compare to its previous iPhone 4, 4S and 3Gs devices. Like the previous releases of iPhone products the new iPhone 5 have also comes-up with the storage capacity including iPhone 5 16GB, iPhone 5 32GB and iPhone 5 64GB with the starting price tag of $199 for two years contract and the price increases with $1000 with the increase in storage capacity. Apple has also announced that iPhone 5 will begin shipping from the 21st September, 2012 in selected countries and will be globally available from the end of this year. Buyers and Consumers can place their pre-orders from 14th September, 2012 here. The main difference between iPhone 4S and the new iPhone 5 is its larger 4-inch screen, a thinner profile and LTE (4G) connectivity support of worldwide, A6 Processor (2x faster than A5), Ultra-fast Wireless connectivity, Bluetooth 4.0 etc. The New iPhone 5 have also got other software, hardware and design upgrades like its large 4-inch display screen with a 16:9 aspect ratio of 1136x640-resolution with a pixel density of 326ppi, full glassy and aluminum body design look, touch sensors with a thinner profile and more responsive input. Apple iPhone 5 is powered packed with A6 processor which performance is twice powerful as compare to A5 processor of iPhone 4S both with general processing and graphics rendering not only this iPhone 5 will also feature LTE (4G) Connectivity with the advanced support of networks such as HSPA+ and DC-HSDPA, Apple further said that iPhone 5 will support 802.11n Wi-Fi standards of 2.4GHz and 5GHz. iPhone 5 Battery life is also impressive with the use of new network support, as Apple claims the iPhone 5 will last for up to eight hours of web browsing on either 3G or LTE networks; talk time is also eight hours on 3G networks. The new and most advanced mobile operating system Apple iOS 6 Firmware will also be include in iPhone 5 and will also be available for iPhone 4 and iPhone 4S in upcoming weeks. Following are the most highlighted List of Hardware, Software and Design Upgrades and Changes made in Apple iPhone 5. These include new and most advanced Features and Specifications of The New iPhone 5. LTE Connectivity Support includes (Sprint, Verizon, AT&T for LTE. In Canada, Rogers, Telus, and Bell). iPhone 5 Retina display resolution: 4-inch (diagonal) widescreen Multi-Touch display, 1136-by-640-pixel resolution at 326 ppi, 44 percent more color saturation, 800:1 contrast ratio, and fingerprint-resistant oleophobic coating on front. iPhone 5 Wireless Connectivity includes HSPA+, DC-HSDPA support. iPhone 5 Wi-Fi Connectivity (2.4ghz and 5ghz on 802.11n). iPhone 5 Built-in rechargeable lithium-ion battery: 225 hours of standby, 8 hours of LTE, 10 hours of Wi-Fi, 8 hours of 3G, and 10 hours of video. iPhone 5 A6 dual processor chip (compared to the A5 it is two times faster but 22 percent smaller). iPhone 5 AirPlay Mirroring to Apple TV support at 720p. iPhone 5 will be available in white and black color. iPhone 5 uses a new type of SIM card (thinner than micro sim-card). iPhone 5 iSight: 8-megapixel, backside flash, hybrid IR filter, five-element lens, sapphire lens, f/2.4 aperture, next-generation ISP, spatial noise reduction, smart filter, better low-light performance, 40 percent faster on photo capture, and HD video recording (1080p) up to 30 frames per second with audio. iPhone 5 FaceTime HD camera with 1.2MP photos and HD video (720p) up to 30 frames per second, improved video stability, face detection, FaceTime over cellular, the ability to snap photos while shooting video, etc. 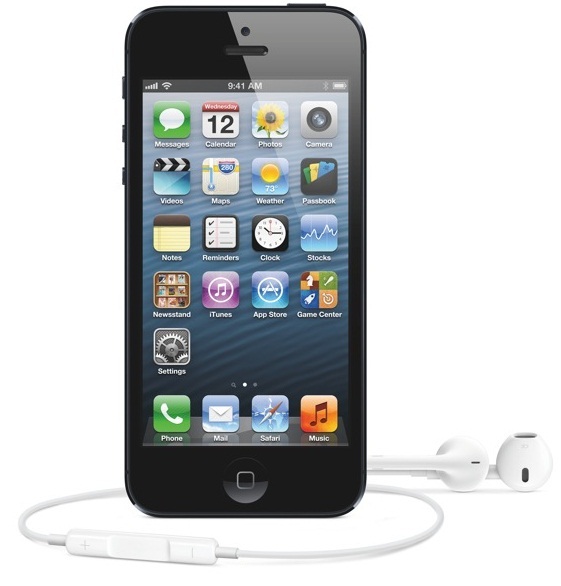 iPhone 5 Audio system: improved speaker design, 20 percent smaller speaker and wideband audio. 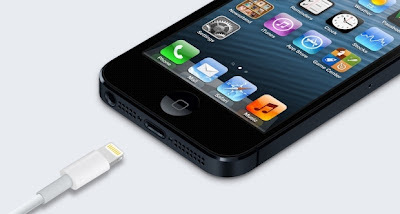 iPhone 5 Connector: “Lightning” (so…Apple will have Thunderbolt and Lightning), all-digital, 8-signal design, adaptive interface, improved durability and reversible. iPhone 5 Apple EarPods with Remote and Mic. iPhone 5 iOS 6 Firmware: Passbook, GPS, Maps (iPhone 4S, 4, 3GS, new iPad, iPad 2… upgrade for free to iOS 6). According to Apple, iPhone 5 will be available for pre-orders for general public worldwide from 14th September, 2012. Consumer and Buyers can place their pre-orders of iPhone 5 from the official website of Apple Store. Apple has also announced that iPhone 5 will begin shipping from the 21st September, 2012 in the United States, Canada, United Kingdom, France, Germany, Australia, Japan, Hong Kong and Singapore and 20 other nations will follow starting next month. iPhone 5 will be available on the other nations and countries by 28th September, 2012 including (Austria, Belgium, Czech Republic, Denmark, Estonia, Finland, Hungary, Ireland, Italy, Liechtenstein, Lithuania, Luxembourg, Netherlands, New Zealand, Norway, Poland, Portugal, Slovakia, Slovenia, Spain, Sweden and Switzerland etc.) by December, it will be available in more than 100 countries around the globe on 240 wireless carriers. Additionally, iPhone 5 will start shipping with the new Apple iOS 6 Firmware and the old iPhone 4 and iPhone 4S users can upgrade to the latest Apple iOS 6 Firmware for free from 19th September, 2012. 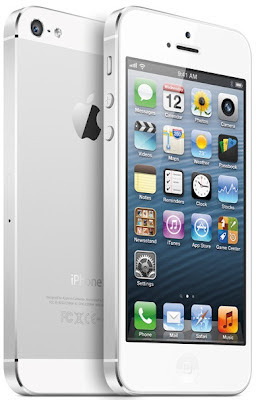 The new iPhone 5 will be available in White and Black colors and comes in 16GB, 32GB and 64GB advanced storage capacity. iPhone 5 will be publicly available for purchasing and buying directly from Apple Store or any other consumer based shopping websites from 21st September, 2012 with the following cost and price tag respectively with a two-year contract from AT&T, Verizon or Sprint. Apple has also reduced the price of the iPhone 4S to $99 only while you can get an iPhone 4 absolutely free of cost. According to Apple, company is keeping the iPhone 4 and iPhone 4S in its lineup. 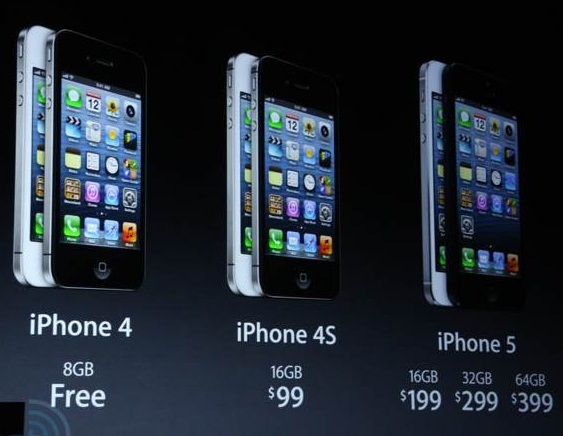 The iPhone 4 (8GB) is now free of cost with a contract period and the iPhone 4S (16GB) will costs only $99. The iPhone 3GS appears to be discontinued. Following is the chart of iPhone 5 in terms of iPhone 5 16GB Model, iPhone 5 32GB Model and iPhone 5 64GB Models with technical specification details. You will get Official Apple iPhone 5 Pictures and Screenshots covering insight Images of iPhone 5 White Model, iPhone 5 Black Model, iPhone 5 with EarPods & iPhone 5 Connectors.